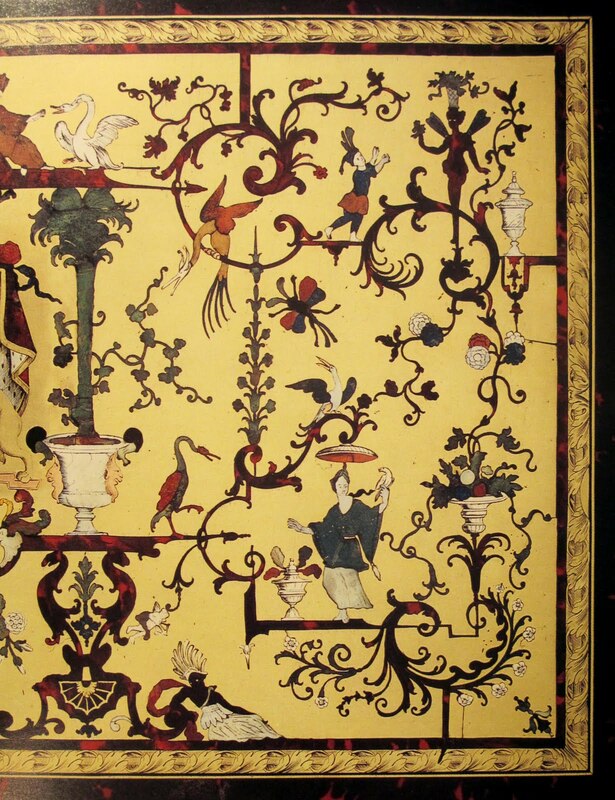 Pierre Ramond wrote a three set volume of books called Masterpieces of Marquetry, published by Getty. It's impossible to overstate the awesomeness of the set. If you can, you should really get your hands on a copy, if only just to pore over the incredible photographs and corresponding pen and ink illustrations. I received these as a gift from a good friend, and have treasured them since. "Marquetry, also called intarsia or inlay, is the art of creating intricate pictures and designs on furniture by skillfully cutting and fitting together thin pieces of colored wood, horn, metal, shell, and other precious materials. While this highly specialized art has roots in ancient times, it was popularized in the eighteenth century in France and today remains centered in Paris. This three-volume set—originally published in French and now available for the first time in English—is the most comprehensive examination to date of the techniques used by expert marqueters in creating their exquisite masterpieces." "The first two volumes are detailed studies of the history of the medium from antiquity to the end of the twentieth century, illustrated with examples from the collections of European furniture and decorative arts in the Musée des Arts Décoratifs in Paris, the Metropolitan Museum of Art in New York, the Musée du Louvre in Paris, the Wallace Collection in London, and the Getty Museum. 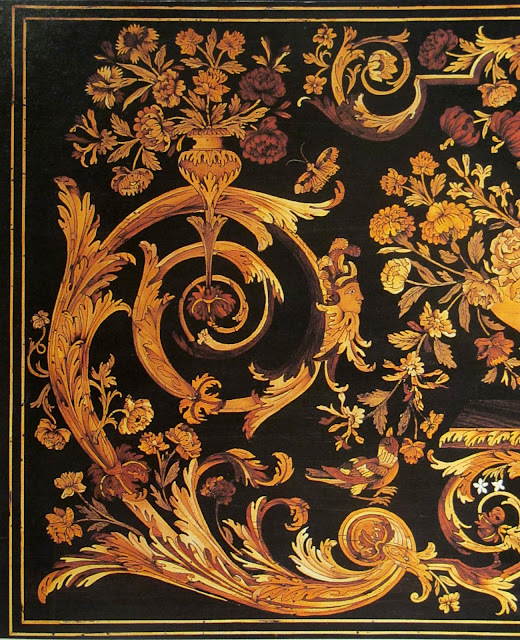 A final volume presents the masterpieces of some of the greatest cabinetmakers and marqueters in history, including Pierre Golle, André-Charles Boulle, Bernard van Riesenburgh, Jean-Francois Oeben, Jean-Henri Riesener, and Abraham and David Roentgen. Methodically organized and lavishly illustrated, this set is an invaluable resource for art historians, antique collectors, and dealers, as well as contemporary fine furniture makers." Ramond was born in 1935 in the southern French town of Soreze, near Toulouse. After studying his craft, Ramond moved and set up a studio at his new home in Paris. During this time he began teaching marquetry at l'École Boulle, the prestigious craft school in Paris, and was named Full Professor in 1978. He is now President of the Jury of Marqueters for the contest of the "Meilleurs Ouvriers de France," lecturing and traveling widely to establish schools of marquetry in Montreal and at the J. Paul Getty Museum in California. It's fascinating how symbiotic the historic relationship is between the development of Art and Technology. The one has always informed the other. As far as marquetry is concerned, the taste for more intricate detail and organic shapes required a smaller cutting blade and stronger steel. The call from the ateliers to the toolmakers was clear: "We need better tools." The same is true today. Even giants like DuPont are working with artists and pushing the boundaries of products such as Corian. I'm getting on to a different topic here, but it's definitely one that I will come back to. We are pioneers! These gorgeous drawings are a great add-on and study aid to an earlier tutorial I posted detailing how to draw the acanthus. Just in time for my birthday. You are one heck of a great resource! How do you keep coming up with such addictive images!!! You give a new meaning to art "dealer"! Got something on Flicker, thank you very much. Wooded contrasts, natural, fire-like, with perfect shapes and magnificent craft to fit it all, in my mind elevates marquetry above all other ornamental art. Outdoor Advertising Murals; a dying Art?